This is Spock's Beard's thirteenth studio album and sees the return of Nick D'Virgilio (drums/vocals) who replaces Jimmy Keegan. This release comprises an eight-track album plus a four-track EP, the latter featuring some ideas created as long as twenty years ago. The segregation is deliberate as it was felt all twelve tracks together didn't make for a cohesive album, but the other tracks were too good not to be heard. 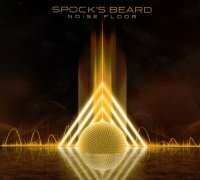 The Beard's sound has changed with successive albums since Neal Morse's departure and 'Noise Floor' continues that trend of being less overtly proggy and more heavy-ish Melodic Rock. What remains, however, is the ability to create superb melodies, hooks and choruses, all of which define another quality release. A statement of intent is laid down with opening number 'To Breathe Another Day' with its immediately captivating refrain and a superb chorus, and it's the first of many earworms. 'What Becomes Of Me' is driven by Dave Meros' wonderful bass refrain. The opening instrumental section isn't indicative of what's to come, the song settling down when the vocals kick in; once again, the chorus is delicious. 'Somebody's Home' starts acoustically then very effectively alternates between heavy and lighter sections − these guys certainly know how to arrange a song. 'Have We All Gone Crazy Yet?' is the longest track and, for me, is a little too Psychedelic and florid, particularly the guitars, to really be a Spock's Beard classic. The structure of 'So This Is Life' makes me think of Pink Floyd, including the David Gilmour-esque guitar solos. 'One So Wise' is unmistakably Spock's Beard as it chops and changes, while 'Box Of Spiders' is an instrumental that would benefit from a little editing, certainly reining in some of Ryo Okumoto's keyboard excesses which sound rather discordant; I prefer instrumentals to be more structured. 'Beginnings' gets things back on track and closes the album in fine style, featuring a great vocal arrangement that couples Ted Leonard and D'Virgilio. The EP tracks aren't throwaway in the least; 'Days We'll Remember' puts me in mind of recent Kansas and 'Bulletproof' is a catchy mid-paced number with another terrific chorus. 'Vaults' has a wonderful refrain and chorus, while 'Armageddon Nervous' (how apt given those currently in charge of the Red Buttons?) is a more accessible instrumental. Aside from a couple of moments I'd like to change, this is another terrific album from a superb band.